Attendees will have the opportunity to hear from visionary local leaders who are actively taking on tomorrow with a strong sense of innovation and direction for Hawaii. 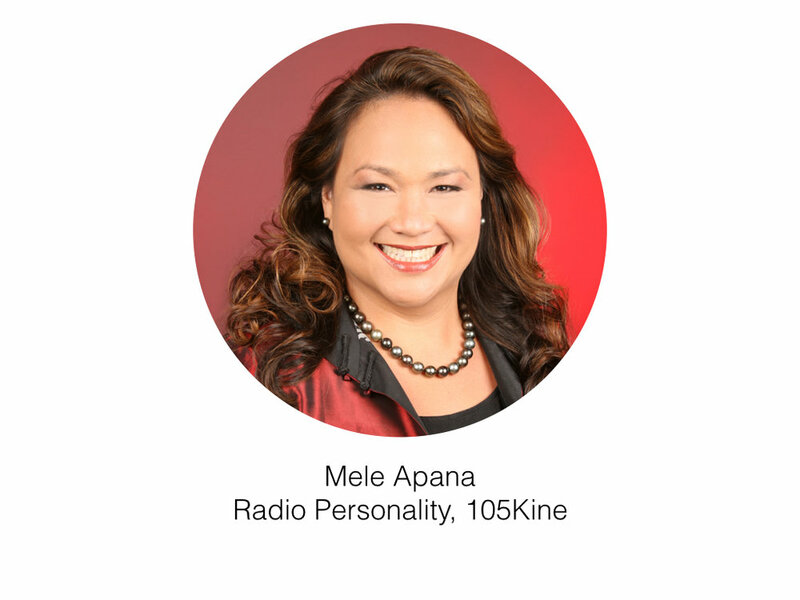 Radio and TV personality, Mele Apana, has been in the entertainment and radio industry for over 30 years. She is a Kaua’i native, born into the renown musical Apana family from Kapa’a and is also a proud graduate of the Kamehameha Schools. Mele is a prominent voice in Hawai’i, and her outstanding work in the music industry and community has been unparalleled, propelling her to become one of Hawaii’s most revered radio personalities and emcees. Mele is also a philanthropist, school teacher, entertainer, pa’u rider, and concert promoter, producing sold out events, including her illustrious Mothers Day Concert. She has championed many radio stations like HAWAIIAN 105 KINE, CNFM100, ISLAND98.5, AND POWER104.3. Conjointly Mele was also an entertainment reporter for KHNL and HAWAII NEWS NOW. 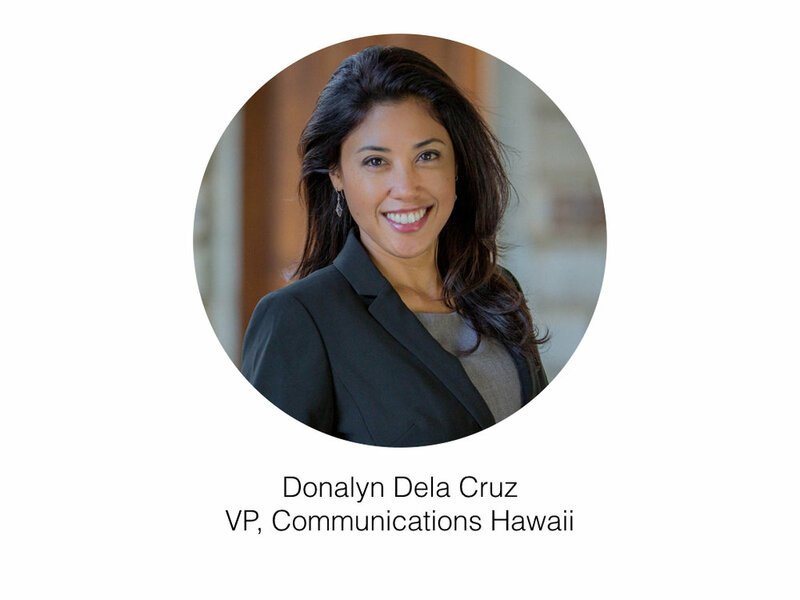 Donalyn Dela Cruz is the Vice President of Communications for S360 Hawaii - a public affairs and strategic communications firm. She has over 20 years of combined experiences in broadcast, print, and digital media, public relations, communications strategy, government affairs, and community outreach. Donalyn was the Director of Communications for the Hawaii State Department of Education, where she strategized and built an internal and external communications infrastructure in one of the largest government agencies in the state. Through her vast knowledge and experience in building relationships with media, business, government, and community leaders, Donalyn’s communications expertise includes understanding issues and their outlier perspectives, strategizing targeted messaging, and fostering collaborative vision among stakeholders in the spirit of positive change. She has served as press secretary for former Hawaii Governor Neil Abercrombie and the late US Senator Daniel Akaka; she worked as the communications director for the Hawaii Democratic Party, public affairs director at the Bernice Pauahi Bishop Museum, and is a former television reporter. Donalyn is a native of Wahiawa, Oahu and a proud graduate of Leilehua High. She holds an MA in Security Studies from the Naval Postgraduate School; and a BA in journalism from the University of Hawaii – Manoa. 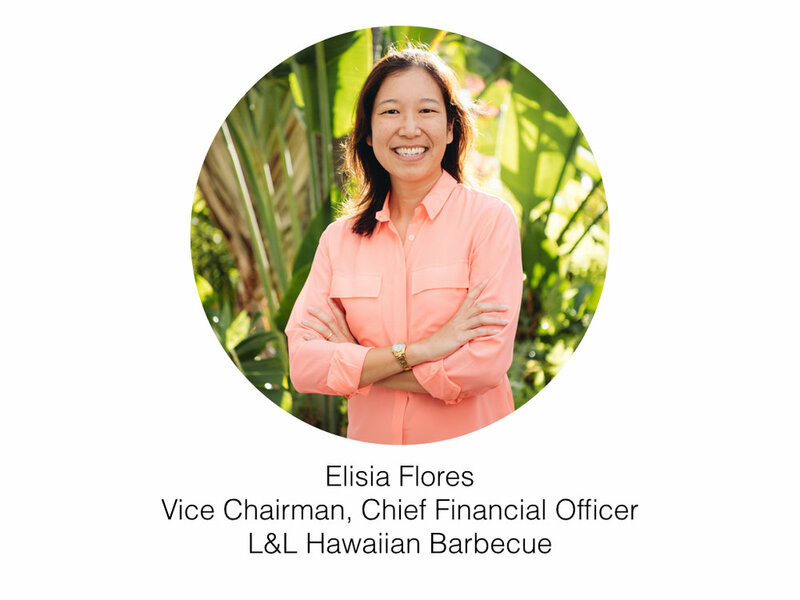 Elisia Flores is the vice chairman and chief financial officer for L&L Hawaiian Barbecue. Previously, she was the senior finance manager for the west region of General Electric’s power generation services business and a corporate auditor at GE consulting on domestic and international audit assignments. Elisia is a member of the board of directors for American Savings Bank and in the community, she serves on board of Diamond Head Theatre, the Hawaiian Humane Society and the Hawaii Restaurant Association and on the advisory boards of the Patsy T. Mink Center for Business and Leadership, the KCC Culinary Arts Program, the UH Family Business Center of Hawaii. Duane Kurisu is Chairman and CEO of aio, a diverse family of companies firmly rooted in local values. aio’s brands include ESPN 1420AM, NBC Sports Radio AM 1500, magazines Honolulu, Hawaii Business, Hawaii Home + Remodeling, Hawaii,and Honolulu Family. aio companies also include Watermark Publishing, Upspring, Pagoda Restaurant and Obun Hawaii. Duane is a minority owner of the San Francisco Giants and Oahu Publications. He serves on the Boards of Central Pacific Bank, Island Holdings, Oahu Publications and was a former University of Hawaii Regent. Duane graduated from Hilo High School and the University of Hawaii with Bachelor’s and Master’s degrees in Business Administration. aio Foundation is the developer of Kahauiki, an affordable, plantation-style community designed for previously homeless families. The project is being developed as a result of key partnerships between businesses, government and other community organizations. Jana Lam was born and raised in Honolulu. After graduating from high school she went to college in North Carolina and then on to live in New York City and San Francisco. After feeling dissatisfied with her career trajectory she decided to go back to College. In Interior Design School at the Academy of Art University, she discovered her love of screen-printing fabric, so in 2010 when she moved home to Hawaii she founded her own hand-printed accessories line. Each piece is hand-printed and hand- sewn in her shop in Kakaako with the help of her small team. 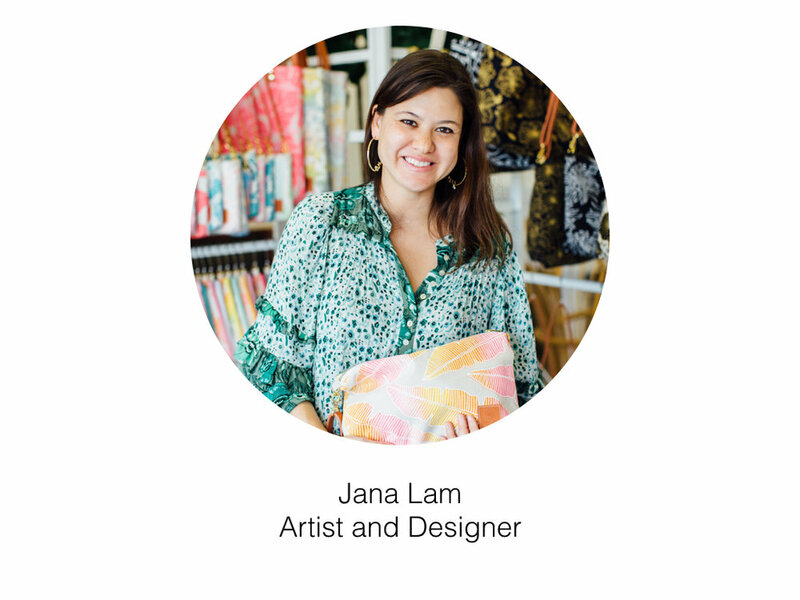 Keeping most of her products "micro batch" and local is a tough challenge, but Jana is proud of being able to offer a unique and beautiful product that is handmade in Hawaii. John Leong’s passion for creating a more resilient Hawai‘i is the inspiration and foundation for his ground-breaking work and accomplishments. As an environmental entrepreneur, Leong has helped to develop Hawai‘i’s green jobs industry, increasing conservation awareness and creating career opportunities in natural resource management and sustainability. After graduating from the Wharton School of the University of Pennsylvania in 2000, Leong founded Pono Pacific Land Management, LLC, a conservation and land management services company. In 2007, Leong co-founded non-profit organization Kupu, to cultivate positive environmental impact by focusing on developing Hawai‘i’s next generation of environmental stewards and community leaders. The growth and success of Pono Pacific and Kupu have earned Leong multiple awards and recognitions. 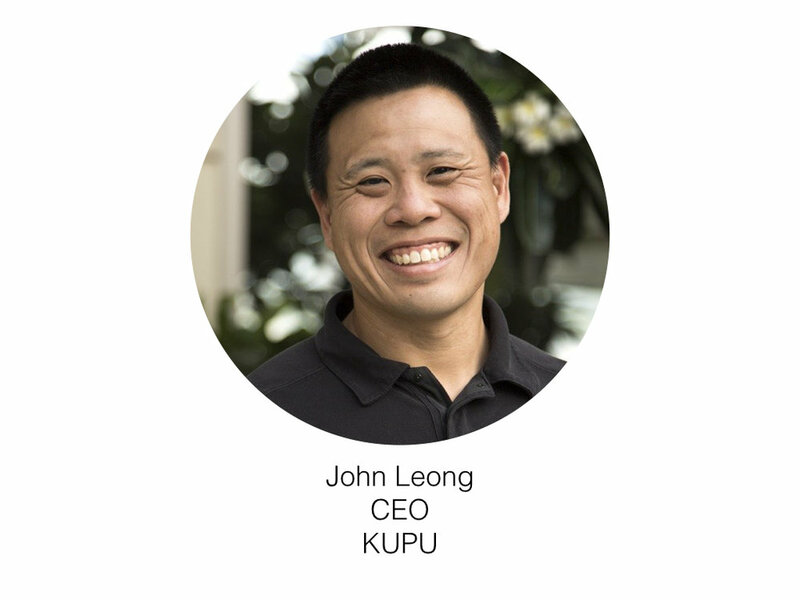 Born and raised in Hawai‘i, Leong is married to fellow high school alumna and Pono Pacific and Kupu co-founder Julianna Rapu Leong. Together they have four young children and live in Honolulu, Hawai‘i. A respected visionary and leader, AHL’s president and chief executive officer, Bettina Mehnert, FAIA, LEED AP is an indomitable force in the evolution and innovation in Hawaii’s architectural sector. Her novel philosophy of practice blends IT solutions, firm culture, client cultivation, and community service as inseparable filaments of professional leadership, keeping her 72-year-old firm firmly faced towards the future. In recognition of her unique management style and leadership, Mehnert has been honored with numerous awards and in 2016 was named a Fellow in the American Institute of Architecture. In 2018, Bettina was appointed by the mayor as one of five commission members of the new Honolulu Climate Change Commission, where she utilizes her expertise in the built environment to advocate for a new era of resiliency. Dr. Kenric Murayama is Chair and Program Director of the Department of Surgery at the John A. Burns School of Medicine (JABSOM) of the University of Hawaii at Manoa. Dr. Murayama graduated from JABSOM in 1985 and completed his surgery training at Northwestern University Feinberg School of Medicine. He has been the recipient of numerous teaching awards from medical students and Residents and has a continuing interest in surgical education and evolution of the training paradigm in surgery. To be better prepared for his administrative roles in healthcare organizations, Dr. Murayama is completing coursework toward an MBA. Dr. Murayama is on the Board of Governors for the SAGES, the American College of Surgeons Advisory Council for General Surgery, and the GI Surgery Advisory Council of the American Board of Surgery. He is a Past-President for both the Southwestern Surgical Congress and the Society of Asian Academic Surgeons. His clinical interests are in minimally invasive surgery for treatment of foregut disorders, morbid obesity, and abdominal wall hernias. He has edited two surgery textbooks and published more than 80 articles, book chapters, and reviews. Unyong leads the Advancement Team at the Shidler College of Business. Through her partnership of 10+ years with Dean Roley, they have raised nearly $255 million for the College’s students, faculty, and programs. Strategic partnerships, program development, board development, alumni outreach, and stewardship are among Unyong’s strengths. The first in her family to attend College and with scholarship assistance no less, Unyong’s professional journey has great personal meaning. Unyong has been recognized by the Chamber of Commerce of Hawaii, Pacific Business News, and Hawaii Business Magazine for her professional excellence and community service. Unyong is proud to serve on the boards of the Bizgenics Foundation, Young Professionals Program at the Chamber of Commerce of Hawaii, and the Patsy T. Mink Center for Business and Leadership. Kevin Sahara is the Director, Market Management with Expedia Group Lodging Partner Services based in Waikīkī. Prior to joining Expedia, Kevin was a Revenue Manager at The Royal Hawaiian, A Luxury Collection Resort where he was named Revenue Management Leader of the Year for Starwood Hotels & Resorts North America Division. Kevin is a graduate of The Kamehameha Schools Kapālama Campus and holds a Bachelors of Business Administration in Marketing and Management Information Systems from the Shidler College of Business at the University of Hawaiʻi at Mānoa. 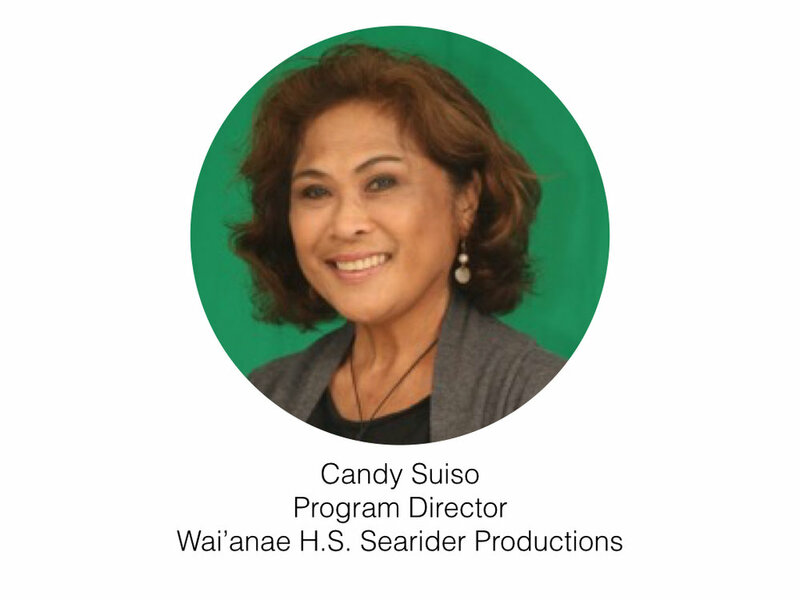 As Program Director for Wai`anae High School - Searider Productions, Candy Suiso oversees one of the most innovative digital media programs in Hawaii. Currently, she is focused on increasing the number of commercial and professional projects in which students participate as well as overseeing fundraising initiatives. Candy grew up in Makaha, graduated from Wai`anae High School, received her B.A. in Liberal Arts from the University of Northern Iowa and teaching certificate from Chaminade University of Honolulu, In 1999, she received a prestigious National Educator Award from the Milken Family Foundation. She began her teaching career as a Spanish teacher at Wai`anae High before starting Searider Productions in 1993. Candy also owns and operates the Makaha Mango farm with husband Mark, a Financial Planner for First Hawaiian Bank. Born and raised in Hawaii, this Bible-loving, world-traveling, amateur coffee-snob has been leading worship for the past 20 years. She toured for years as the worship leader for The Revolve Tour, a teenage girls conference, put on by Women of Faith while also traveling with award winning singer, Natalie Grant, as her sole back-up singer. In 2013, she started the BLOOM Conference in Hawaii which has now seen thousands of girls come through, encouraging them to "BLOOM where they are planted" and become all that God created them to be. Tiffany has a huge heart for the Church and continues to travel as a worship leader and speaker in hopes of building up and resourcing tomorrow's leaders. She currently lives on O'ahu with her husband, Keoki, and their two sons, Thurston William and Punahoa Kingston. Jared joined the family business in 2009. The company manages and leases properties in Oregon, Colorado and Hawaii. 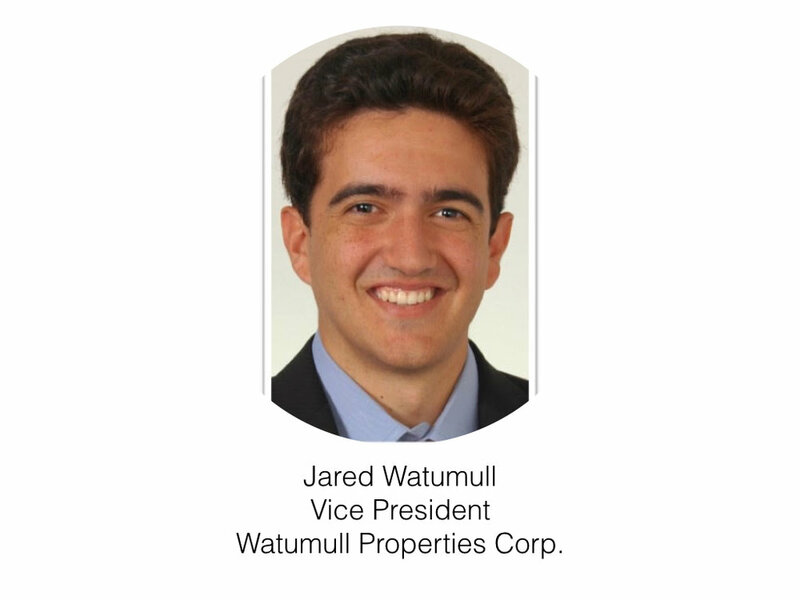 Prior to joining Watumull Properties, Jared was a sales associate at the Honolulu office of CBRE, focusing on sales and leasing of shopping centers throughout the state. Jared in a graduate of the University of Colorado at Boulder. Ruben Yamada was born and raised on Maui where he attended the Kamehameha Schools Maui Campus. After graduating, Ruben moved to Spokane, Washington to study at Gonzaga University where he studied Business Administration and got involved with the Office of Admission. After several years working with the Office of Admission at Gonzaga University, Ruben got the opportunity to move closer to home as Assistant Director of Admissions at Hawai‘i Pacific University. 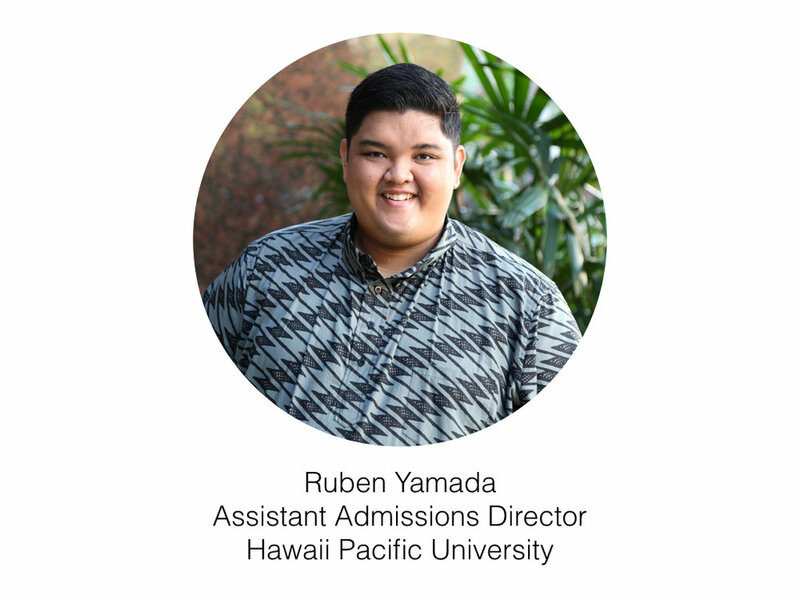 Ruben has a passion for helping students from Hawai‘i with their transition to college and finding the right fit. A third generation seamstress, Kiniokahokuloa “Kini” Zamora has viewed his world through the eye of a sewing needle since age 10. Under consistent tutelage from his Aunty Delilah, this interest turned into a hobby that sparked a lifestyle. Kini attended Honolulu Community College’s Fashion Technology program and New York’s Fashion Institute of Technology. Kini has been a finalist on both Season 13 of Lifetime’s Project Runway and Season 5 of Lifetime’s Project Runway All-Stars, He continues his strides in fashion with a full calendar of events Fashion shows, workshops, speaking engagements, pop up shops and working daily at his studio The Clique by KZ. The Clique is home to his retail store, manufacturing, embroidery, hair, makeup and photography studio. His local and custom designs are ever-changing, relevant, and in demand for an assortment of consumer and industry needs. Active in the community, Kini is generous and giving of his time, product, and aloha to a variety of local and international organizations, charities and events to benefit businesses and individuals. His natural talent and appreciation for Hawai‘i and its people inspire him to elevate the art and industry of fashion. Kini is the true embodiment of an artist who loves to share himself through his designs, soul to soul. Jennifer Chun is the Hawai‘i Tourism Authority’s Director of Tourism Research. She has analyzed tourism data in Hawai‘i for more than 20 years. 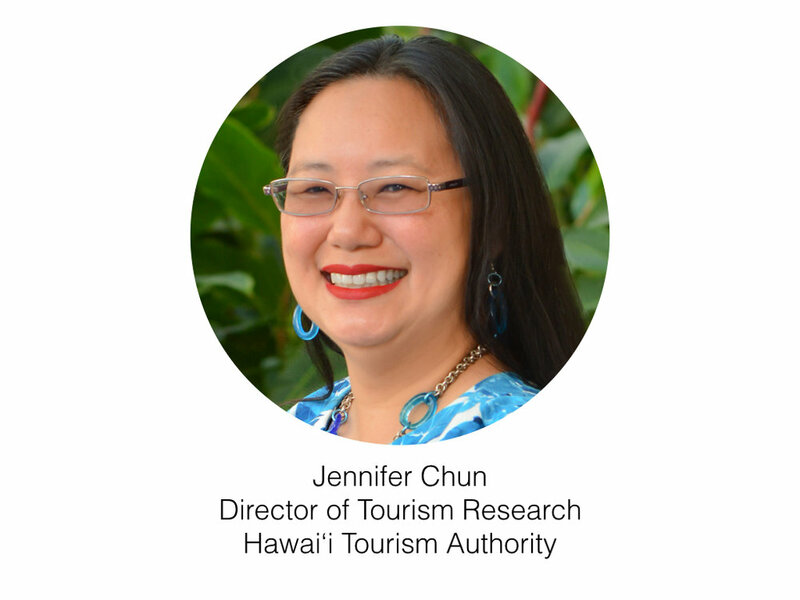 Jennifer leads HTA’s Tourism Research Division, which provides strategic analytical information about Hawai‘i tourism and conducts special research that supports the state’s marketing and product development efforts, planning by industry partners, and policy making. Prior to joining HTA, she was the practice Director at Hospitality Advisors LLC, Hawai‘i’s leading hotel, tourism, and real estate consulting firm and was formerly a member of PricewaterhouseCoopers LLP’s Global Hospitality & Leisure Industry Group. Jennifer previously assisted PwC's Honolulu High Tech Practice and Japanese Business Practice clients, including start-up companies and CFO Outsourcing services. Jennifer has a wide variety of engagement experiences including 1031 exchange, market studies, litigation support, forensic accounting and foreclosure support for the hospitality industry, including tourism, resorts, lodging, food and beverage, attractions, golf courses, real estate, development and transportation. Since his arrival in Hawaii as a 16 old immigrant, Eddie Flores Jr., president of L & L restaurant chain, has distinguished himself as a successful entrepreneur and a community activist. The early years were very trying, and Eddie was compelled to work to support himself. Two years after his graduation from University of Hawaii, he unleashed his entrepreneurial spirit and formed his own real estate company. In 1976, he purchased his first L & L as a gift to his mother. Subsequently, Eddie expanded L & L from a single store into 200 restaurants during a time of unprecedented economic hardship in Hawaii. Perhaps the most impressive aspect of the way Flores runs his business is his generosity and unselfishness. Eddie has provided loans, credit, and lease guaranty for his employees in the L & L restaurant chain so they can share the same American dream. In 1998, Eddie won the State of Hawaii Small Business Administration - Small Businessperson of the Year, which epitomized his success in business. For many years, Eddie has served as the chairperson of the Small Business Assistance Program for the Filipino Chamber of Commerce of Hawaii, which awarded him the Entrepreneur of the Year. Eddie was also awarded the University of Hawaii Distinguished Alumni Award, Presidential Citation for Filipino Individuals & Organizations Overseas, Junior Achievement Wall of Fame, Best in Business: Business Leadership Hawaii, Sales and Marketing of the Year, and Ernst and Young Entrepreneur of the Year for Food and Beverage. Eddie taught real estate, investment, management, travel, and business appraisal courses throughout the state. As an instructor, Eddie received the highest honor by the Hawaii Association of Realtors as the Highest Rated Instructor and Educator of the Year. Eddie was the first Asian American to receive the designation of Certified Business Intermediary and Designated Real Estate Instructor. As an author, Eddie has written four books - "Listing and Selling Business Opportunities" “260 Million Winning Recipes”, “108 Tips on Travel, Culture, and Business in China” and "How to List and Sell Business Opportunities". He has also published articles locally and internationally on various subjects such as real estate, investment, and business appraisal. Eddie has served in many boards and commissions which include the Honolulu Police Commission, Chaminade University, East-West Center, Honolulu Board of Water Supply (former chair), The Investment Group Realtors, Hogan’s Advisory Board, etc. Ma Ry Kim, one of the state’s most coveted international architects, joined G70 in 2014 as principal and design director. The former Gensler Europe design director has over 20 years of experience and is recognized for multiple award-winning projects worldwide and for her architectural contributions to emerging economies within the Middle East and Europe. She has been a professor at several universities including at the University of Hawaii at Manoa School of Architecture; she is the mother of five dyslexic children, and lives and breathes the mantra of turning learning challenges into amazing gifts. 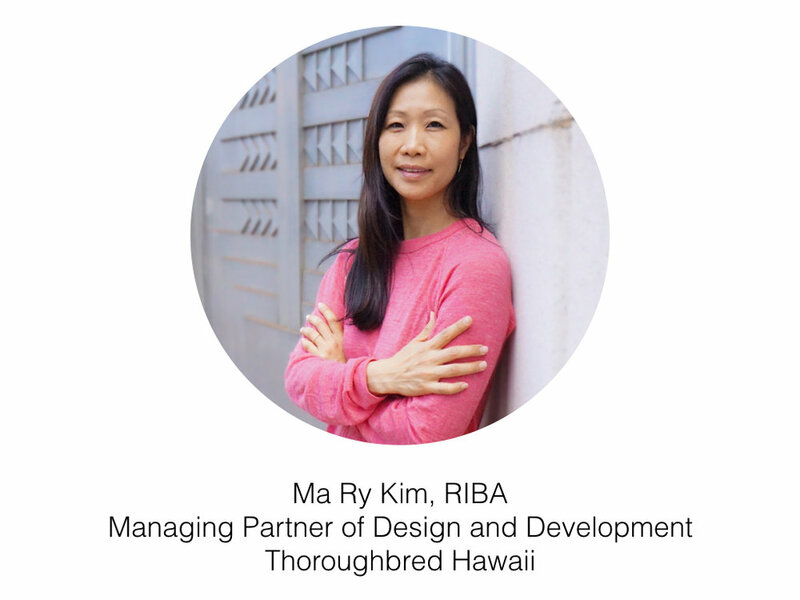 Most recently, while maintaining her role as a principal and design director with G70, Kim assumed the role of Managing Partner of Design & Development for Thoroughbred Hawaii, a private equity firm under The Thoroughbred Group. Bringing together her design and business backgrounds, she works towards building sustaining economic vehicles for organizations through new development and investments in Hawaii and the Pacific Rim. Donavan Kealoha is a technology investor at Startup Capital Ventures, an early stage venture capital firm. In this role, Donavan identifies, invests in, and helps promising early-stage, high growth companies. Donavan serves on the board of directors for AreaMetrics and Hobnob; he is also a board observer with Breinify. Donavan is also a co-founder and Executive Director of Purple Mai’a, a 501(c)(3) education technology non-profit organization. Donavan is a licensed attorney and a proud product of the Hawaiʻi public educational system. He graduated from Lana’i High School, and holds a BA, and JD/MBA from the University of Hawaiʻi at Mānoa. 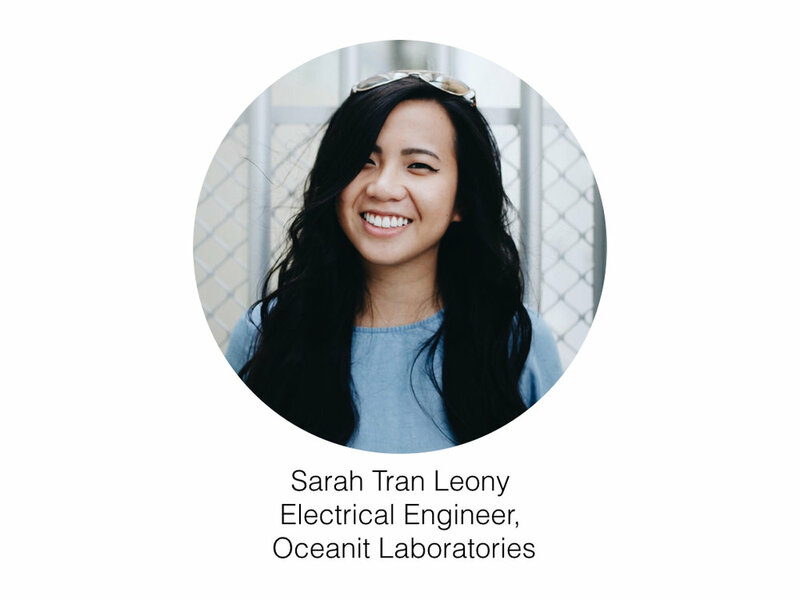 Mrs. Leony is an Electrical Engineer for Oceanit, an innovative technology company that has received numerous awards and patents for their disruptive designs. She is currently the lead Software Defined Radio Developer for several Department of Defense projects that has been awarded over $3 million. She received her BS degree in Electrical and Computer Engineering from the University of Oklahoma, graduating with Special Distinction. Prior to working at Oceanit, she was a Robotics Engineer at NASA Kennedy Space Center, designing, building, and testing electromechanical systems in the Swamp Works Lab. She has also spent time working for Chevron, Shell, and Exxon Mobil in R&D, Offshore on a Production Platform in the Gulf of Mexico, and as an Instrumentation Engineer in a Refinery. Her leadership experience includes Robotics Team Captain for FIRST Robotics Competition, Women in Electrical and Computer Engineering (WECE) Chair, and a Multicultural Engineering Program Ambassador. Lori McCarney served as the CEO of the non-profit Bikeshare Hawaii since 2014. She led the multi-faceted effort that made Biki a reality in June 2017 and led it through its very successful first year. Biki operates 1000 bikes at 100 Biki Stops from Chinatown to Diamond Head, achieved its millionth trip on August 17, 2018, and will add 36 new locations in late 2018.Lori has 40 years of senior management experience in a variety of industries in local, national and international markets. She specializes in business strategy and marketing. Kimberly Morris is the Chief Operating Officer for Girl Scouts of Hawai’i where she oversees operations, programs, and membership for the organization. Prior to joining Girl Scouts of Hawai’i, she worked at Chaminade University as their Director of Annual Giving, fundraising for the Marianist University as well as the President of Junior Achievement of Hawaii a non-profit organization dedicated to building financial literacy, work readiness, and entrepreneurship to students Kindergarten through 12th Grade. She currently serves on the Chamber Young Professionals Steering Committee as the Events Chair, the YMCA Alliance Board, and has been a youth cheerleading coach for the last 11 years. Kimberly has also been recognized as one of the 2014 40 under 40 recipients by Pacific Business News. Founder of ClimbHI. 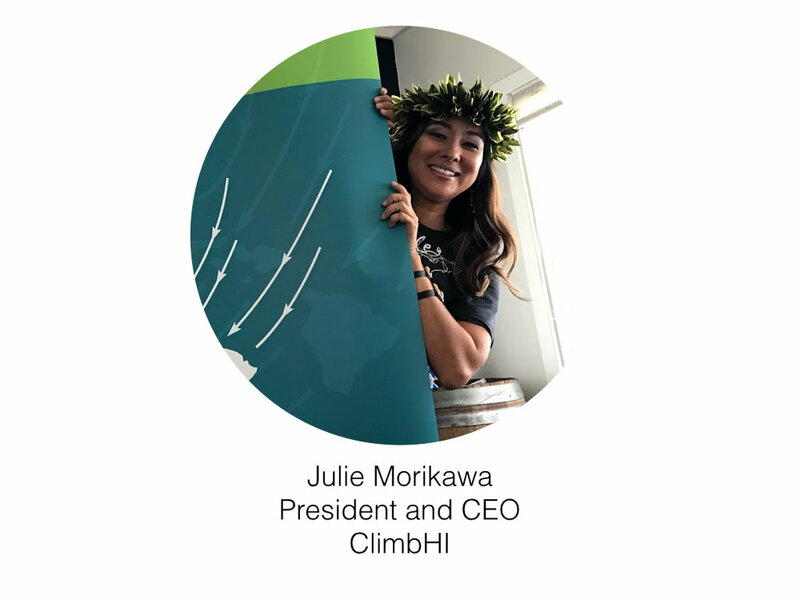 Julie has served as the President and CEO of ClimbHI for the past 9 years. Julie is also the President of Full LLC, a Marketing and Revenue Consulting company helping companies ranging from hotels and restaurants to hospitality technology and service providers. Prior to this she worked with multiple hotel technology companies as the West Coast Director of Business Development for Travel Tripper, a next generation eCommerce company helping hotels maximize their direct business; and the West Coast Hotel Partnership Director for Roomlia, a mobile app in the travel space. Her passion for the hospitality industry started at the age of 7 while dancing hula on cruise ships and in Hawaii hotels, and has grown into 17-years of experience in the world of hospitality and online travel agencies. She began a 9-year career with Expedia as the Market Manager of Hawaii, and subsequently served as Market Manager of Australia and French Polynesia based in Sydney. She returned to Honolulu as the Director of Market Management where she oversaw the team responsible for Expedia’s relationships with hoteliers in Hawaii and French Polynesia. Before joining Expedia, Julie was the Director of eCommerce for Aston Hotels & Resorts, where she helped establish the chain’s online distribution strategy. Earlier in her career, she was a Hospitality Consultant for Pinnacle Advisory Group, and held a number of jobs in properties such as Disney’s Polynesian Resort, Bellagio in Las Vegas, and New York’s Trump Intl Hotel & Tower, where she received exposure to numerous facets of hotel operations, from rooms to sales. Julie holds a BS in Hotel Administration from Cornell University and is the former President of the Cornell Hotel Society in Hawaii. Born and raised in Honolulu, Jacob Noh is a HR Consultant at SimplicityHR by ALTRES. Since 2011, Jacob has been serving small to large businesses throughout the state with his experience and expertise in providing knowledge-based solutions for employer related topics and issues. He has been a trusted resource for over 7 years advising organizations on the complexities in employee benefits, payroll, human resources, risk management, and safety. Jacob currently serves as a board of director for Catholic Charities Hawaii; one of the largest social services agencies in Hawaii with over 30 programs statewide assisting over 40,000 children, families, seniors, and immigrants. Also serving as the Chair for the Chamber of Commerce Hawaii Young Professionals Program and board member for the Chamber of Commerce Hawaii, Jacob is the voice for the next generation of leaders in Hawaii. Other boards that Jacob sits on is Dream House Ewa Beach Charter School non-profit board. He looks to push the movement further for the young professional demographic to become more impactful individuals in bettering the success of their future and the sustainability of our business community. 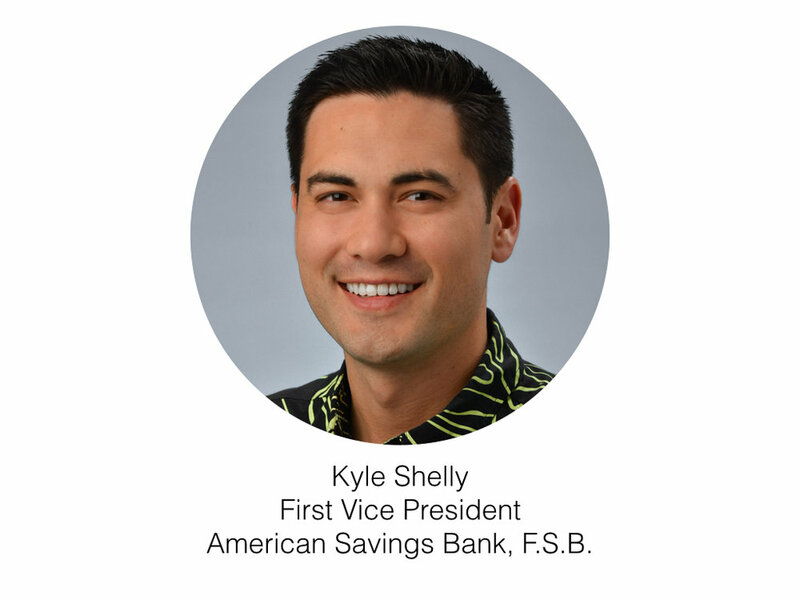 As an officer in American Saving Bank’s Corporate Banking department, Kyle leads a small team that manages a diverse mix of commercial banking relationships ranging from local Kama’aina businesses to large national corporations. His current portfolio of loan assets exceeds $200 million and continues to expand under his leadership. Guam born and raised, Kyle started his finance career working in California as a mergers and acquisitions analyst. Kyle remains an active participant in the community and proudly serves as Chair of Fundraising for the Young Professionals Program at the Chamber of Commerce of Hawaii. Kyle recently graduated from the Pacific Coast Banking School administered at the University of Washington. Kyle also holds a Certificate of Executive Leadership from the Michael G. Foster School of Business. In recognition of his journey thus far, Kyle was honored as one of PBN’s 40 under 40 class of 2018. Sumil is a materials engineer and tech innovator with Oceanit. There he demonstrates and adapts new technology for real world application, overseeing the construction and operation of various field test facilities. Born and raised in Honolulu, he left Hawaii to earn his Bachelor’s from Stanford University and after returning earned his Master’s from UH Manoa. Heavily involved with Oceanit’s educational and outreach programs, he has been facilitating Design Thinking workshops for adults and students since 2011. In 2017, he helped launch Oceanit’s Altino Coding Cars program as a lead instructor. The program aims to help school teachers learn programming skills to enrich the learning experience for their students and was recognized with HVCA’s Social Impact award for 2017. Mr. Tokumi is a Civil Engineer at Oceanit. He graduated from Roosevelt High School in 1990 and earned his Bachelor degree in Civil Engineering from the University of Hawaii at Manoa in 1997. After UH, he lived and worked in Las Vegas as a Civil Engineer for the past 19 years before moving back home in 2017. His experience covers a variety of civil engineering disciplines, including flood control, water and wastewater utilities, and roadway design. The challenge he undertakes along side with our local community involves implementing sensible infrastructure solutions that provides the desired functionality, while also blending well with the community and natural beauty of Hawaii. 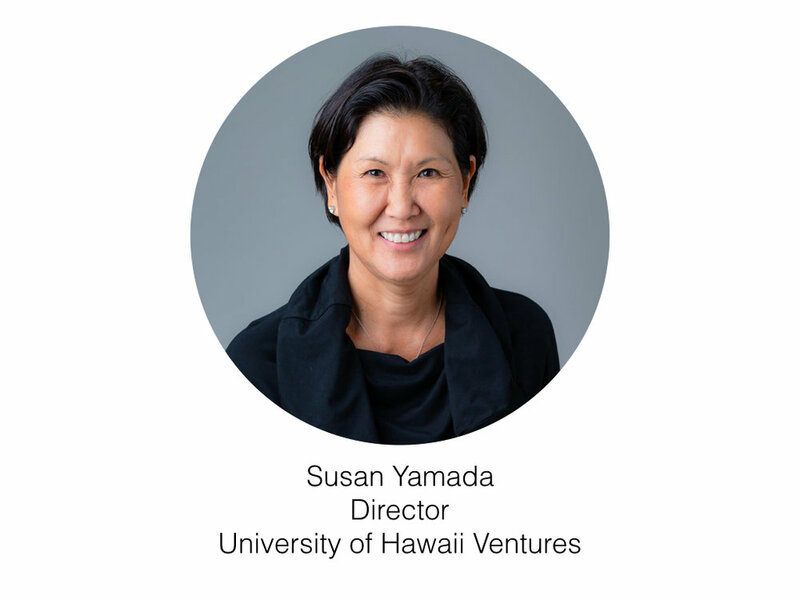 Ms. Yamada began her tenure as Director of University of Hawaii Ventures in July 2017. She is responsible for creating a center for innovation whose mission is to educate students to think entrepreneurially, support University entrepreneurs, and commercialize University-generated innovations. She served for nine years as the Executive Director of the Pacific Asian Center for Entrepreneurship (PACE). PACE is the home for a set of experiential entrepreneurship programs located in the Shidler College of Business at the University of Hawaii. The Center’s 20+ programs offer mentorship, training and resources to all UH students and faculty and are designed to encourage entrepreneurial thinking across disciplines and inspire entrepreneurs to move their ideas from conceptualization to commercialization. She also heads the Yamada Scott Family Foundation, founded in 2000, whose mission is to inspire and support Hawaii’s students in maximizing their potential via educational grants and scholarships. Ms. Yamada’s community service positions include: current board member and past Treasurer, KCAA Preschools; current board member Island Pacific Academy, past Treasurer, Hawaii Nature Center; past-Chairman of the Board, Japanese Cultural Center of Hawaii; and past Vice Chair, Entrepreneurs Foundation. Ms. Yamada grew up in Hawaii, graduated from James B. Castle High School, and earned a BBA degree from the University of Hawaii and an MBA degree from San Jose State University. She has two children and enjoys golfing, traveling, reading, and spending time with family and friends.